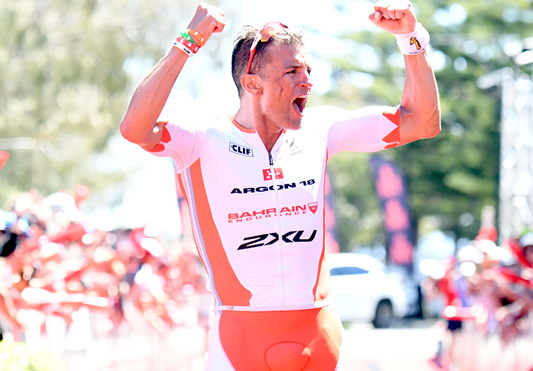 Terenzo Bozzone has successfully defended his title at Ironman Western Australia, his second win in as many weeks as the Kiwi solidifies his comeback to racing. With the tandem wins here and at Ironman 70.3 Western Sydney, Bozzone is back to business as usual after the bike crash five months ago that threatened to end his career. In fine swim form, Bozzone emerged from the 3.8-kilometer swim leg one minute ahead of the rest of the field. Former professional cyclist Cameron Wurf made good on his stated goal to break the bike course record, catching Bozzone through the first third of the 180-kilometer looped bicycle course and building a lead of nearly four minutes by the time he hopped off the bike. However, the real race was on the marathon as Bozzone found his legs and caught the Aussie with 30 kilometers to go. In Ironman Western Australia’s 15-year history, Bozzone is the first athlete to win thrice and only one to win in consecutive years. He started his streak in Busselton in 2016 when he broke the course record. “I do enjoy coming to Busso, and to win three titles and put my mark on the race is very special to me,” Bozzone said. Bozzone is expected to join his Bahrain Endurance teammates Holly Lawrence and David Plese on the starting line at Ironman 70.3 Middle East Championship Bahrain. Jan Frodeno, Alistair Brownlee, and Daniela Ryf are also slated to participate in the team relay division.